I want to integrate PayPal to my form but only if certain conditions are met on the form. I've used conditions to show/hide fields, but when I tried to hide the PayPal field based on a condition on my form I was still taken to the PayPal page when the form was submitted. Is it possible to redirect to PayPal ONLY when certain conditions are met on my form? You can have look at this forum post & this form http://www.jotform.com/form/10954938497 to see the logic behind how to achieve that functionality. If you are unable to figure it out. You could post up the url of your form, ll clone it and have a go at it for you. I took a look at the form sample you provided and its a bit different than mine. I only have one product i want to offer via paypal. Under certain conditions, i want to dharge a deposit - based on data entered in other fields. if that data is not present, then there is no deposit and i don't want to go to paypal. i have a paypal field with only 1 product. that product is not displayed by jotform since it is the only one. i have conditions to "show" or "hide" this field based on conditional data, but since it is never really displayed i think that this approach may not work for me. btw, when i import the sample form you provided the conditions didn't come with it. 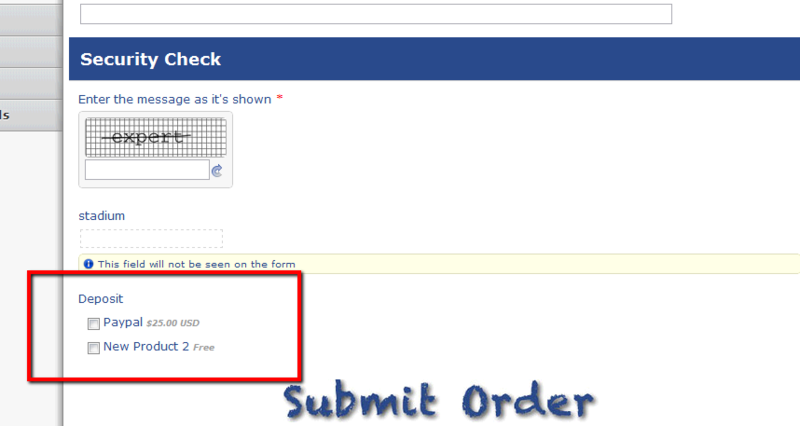 I have built your form with a conditional paypal option. I am not entirely sure of exactly what conditions you want to use, so i added an extra size & built the 'deposit required' condition around that. i.e 1x1 ($10) wont require a visit to paypal. Please review the forms functionality closely, I believe its very close to what your looking for. You can import that form, edit the conditions to your liking to show/hide that 'deposit required' field (and the need to visit paypal). pls note: i also changed the notifications email address, so that i wasnt sending order requests to you during my testing. Youll need to remember to change that, if you choose to use my form as the basis for your own. Please let me know if you need any clarification or have any questions. Thanks for all your help. I see how it works. However, the Deposit Required field shows up on the form when any size other than the one you created. Is there a way to do this so it never shows up? I don't need the users of this form to see this field. they might try to "uncheck" it thinking that they won't have to pay a deposit. i think it is confusing to have it displayed. or is there a way to display it and "protect" it so that it shows up based on conditions and is checked and the user can't change it. Hey. Yes the 'deposit required' field only shows when the conditions for requiring a the user to pay a deposit are met. The deposit required field is a required field so its impossible for users to submit your form without having that paypal radio button checked. I, personally, dont think its confusing. In any case, I have editted the form to totally hide the paypal section, even tho it remains conditional. Please have a look at the forms functionality. If you need any help reconfiguring this form to your specific conditions or need any further clarification, please let me know. I imported this form and can't figure out what you did to it. Can you please explain what I should be looking for? I don't see the paypal section. I dont' see any new conditions. I'm lost. I really need this to be working tomorrow. When replying please do more than just point me to a form and say "figure out what i did". please take the time to explain becuase I don't understand how these forms work. Sorry for any confusion I have caused. I should have been more explicit in explaining exactly what I have done. 1). First I used the paypal wizard to create a 'deposit' field with 2 products. 2) Based on a condition of my choosing, (size not being 1x1), i show/hide this 'deposit' field. 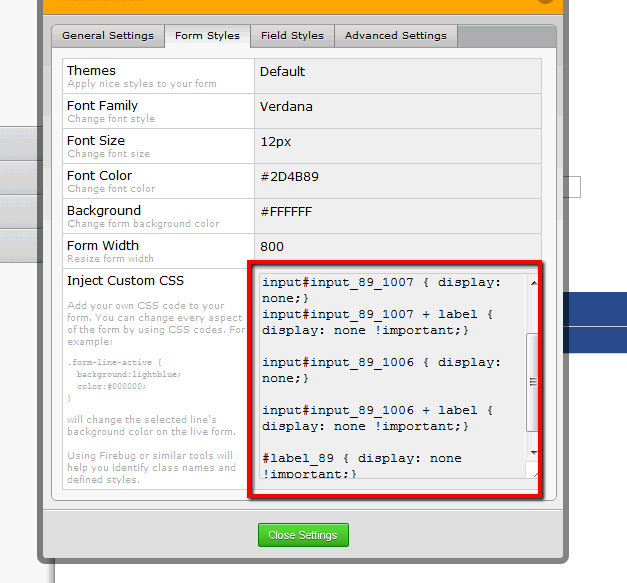 5) Then do a custom css injection to hide them. This is a rather complicated workaround to provide the exact solution your looking for. I honestly do understand your frustrations that this functionality isnt just click & go like much of the rest of JotForm. Maybe it's something the developers can look at in later versions of JotForm, but your precise needs are relatively uncommon. If you are struggling to tailor your form to your exact needs with the ideas I have put forward in this post; just tell me the exact conditions under which you want a user of the form to be directed to paypal to pay a deposit. Maybe If I provide that precise solution youll be able to deconstruct my method a little better. Thank you! This is extremely helpful. The CSS injection was the part I was missing. I haven't used that feature much and had forgotten all about it. I really enjoy using JotForm and also want to say that your customer service is excellent! I don't expect you to do my work for me - and you provided more information than you needed to - but I do appreciate all the help all of you give on this forum. You do a great job! Hey. Thanks for the kind words! The developers are constantly working on new features based on feedback & questions from users on this forum, so keep the questions and feature requests coming. If your form still isnt exactly as you want. No matter how seemingly trivial, just let me know, I will see if i can fill in any remaining gaps for you.